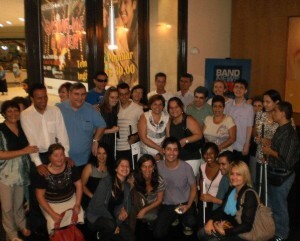 Even the chaotic end of the day in São Paulo with many points of flooding and stuck traffic didn´t prevent that 40 visually impaired people and their companions watched the second presentation with audio description of “Ensina-me a viver”, (based on the movie Harold and Maude), at Teatro das Artes, yesterday (2/27). This time, people from different associations were there: PRODAM (Empresa de Tecnologia e Informação do Município de São Paulo), Associação de Cegos from the city of Taubaté, Itau Bank, Unibanco Bank, Cielo, SP Turis, Grupo Retina São Paulo, Santa Marcelina College and Anhembi-Morumbi College. The audio description, result from the partnership between Programa Vivo Encena and Primeira Página Produções Culturais, allowed all these blind people to appreciate the play with all the audience, having access to the scenario, costume design, gestures, expressions and the conduct of the scenes. All of this is very important to the understanding of the play. The testimonials of Laercio Sant´Anna, systems analyst of PRODAM, points to the importance of accessibility in theaters and in other places of entertainment. “Yesterday I had the pleasure to watch, at Teatro das Artes (Eldorado Mall in São Paulo city), the famous play Ensina-me a viver (based on the movie Harold and Maude). Starred by Gloria Menezes and Arlindo Lopes, a huge success with public and critics that touched more than 250 thousand people in São Paulo and Rio de Janeiro with more than 300 performances. This play is back to São Paulo for a short season. Audio description was the big difference this time. For the first time Teatro das Artes offered this resource. It happened last Sunday and yesterday. It was very good to get to the theater, buy my ticket and had the conditions to absorb all the content of the play, thanks to the quality of the audio description. Although I went there with my wife, I was able to appreciate all the structure set for people with disabilities. When I got to the ticket booth I was approached by an assistant that promptly offered to lead me to my seat in the audience. Getting the personal headphone for the audio description, another assistant was at my convenience to help me with any problems I could have with the equipment as well as to explain me how to use it. I say “it was good to get to the ticket booth and buy my ticket” because for the first time I felt like a spectator with the same rights and obligations like any other. I paid for the right to watch the play and I had, through the resource of audio description, the same understanding about everything that happened on stage. The feeling was full citizenship! .A fact that made me very happy refers to the respect to audio description showed by the actors. Due to the strong storms that fell in São Paulo yesterday afternoon, the traffic got very complicated. A group of visually impaired people that would come from the city of Taubaté hadn´t arrived until the time for the beginning of the session. The protagonist herself, Gloria Menezes, asked to the audience to have a little more patience because we would wait for that group to arrive. I couldn´t hear any disapproval from the audience with this request. The group arrived in time and the play was a great success. At last, by the end of the play, the actor Arlindo Lopes thanked our presence and for my joy, one more time he reinforced the audio description matter with a speech that was in tune with this cause. I don´t have the slightest doubt that we won one more partner to our fight for the audio description in the media. Thank you very much Gloria and Arlindo for your patience and sensibility with the cause of audio description. Thank you to all actors for your attention and tenderness with us at the end of the play and for your commitment with this issue. And a special thanks to Livia and the team of collaborators from Vivo for allowing us to enjoy such a wonderful spectacle by offering, although the afternoon had been very rainy, such a pleasant nightfall. morre neatly-liked than you might be now. I tried to post a comment previously, but it has not shown up. I believe your spam filter may possibly be broken? Thank you for your msg. We haven´t received your msg previously. Thank you for your msg. Where are you from? Are you interested in cultural accessibility?